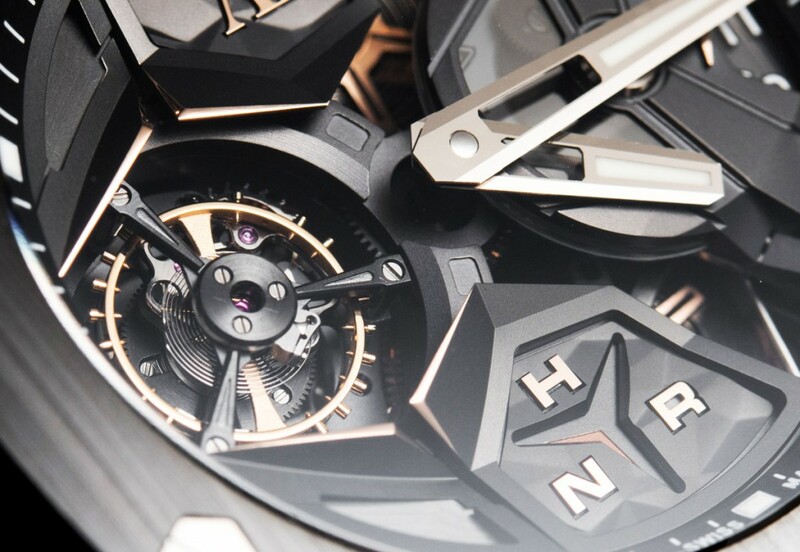 There were many impressive releases at SIHH 2018 that were left uncovered, but some deserve us taking a step back. 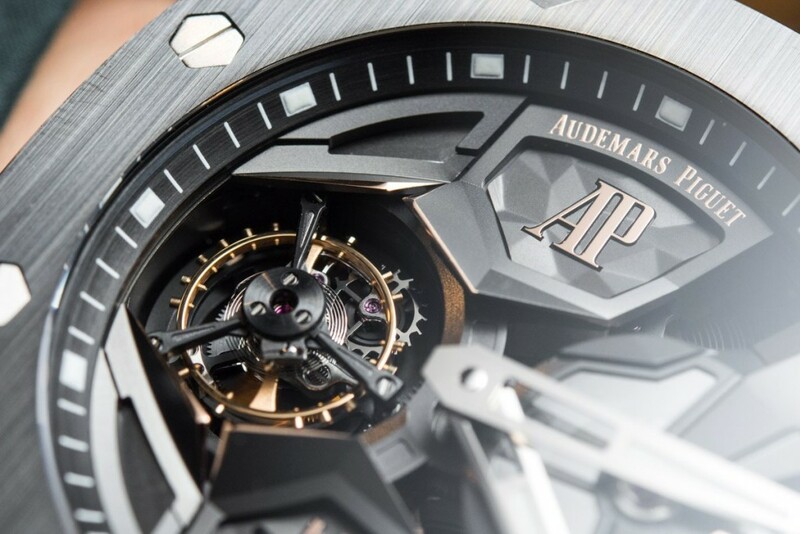 Among such timepieces is the “Audemars Piguet Royal Oak Concept Flying Tourbillon GMT” that introduces some new significantly bold design concepts, while also equipped with a flying tourbillon. 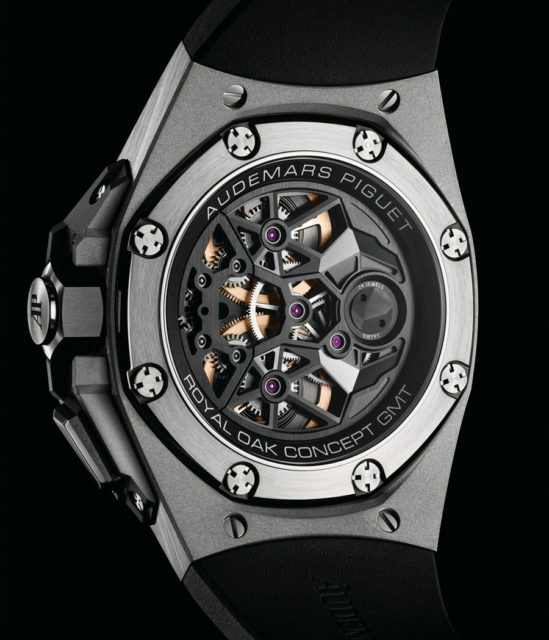 It was back in 2002 that the first “Audemars Piguet Royal Oak Concept” was released. 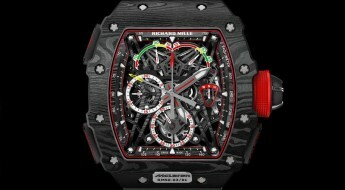 Since then it has served to launch some of the brands most futuristic-looking timepiece models in their catalog. 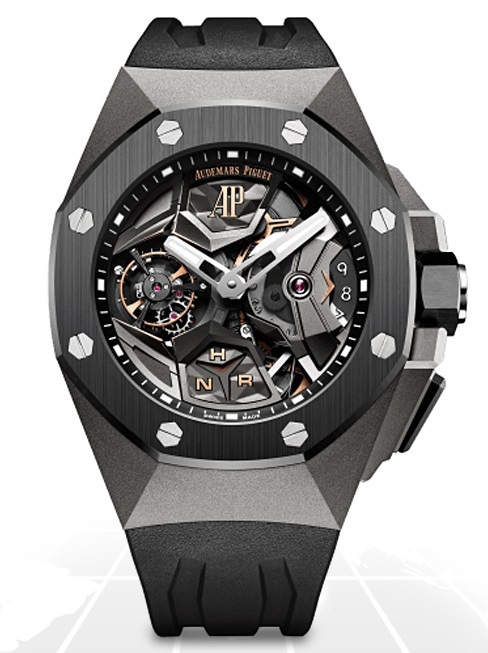 If the “Royal Oak Offshore” has become the standard iconic model which should remain unaltered, the “Royal Oak Concept” is indubitably where Audemars Piguet lets their experimental designs shine. 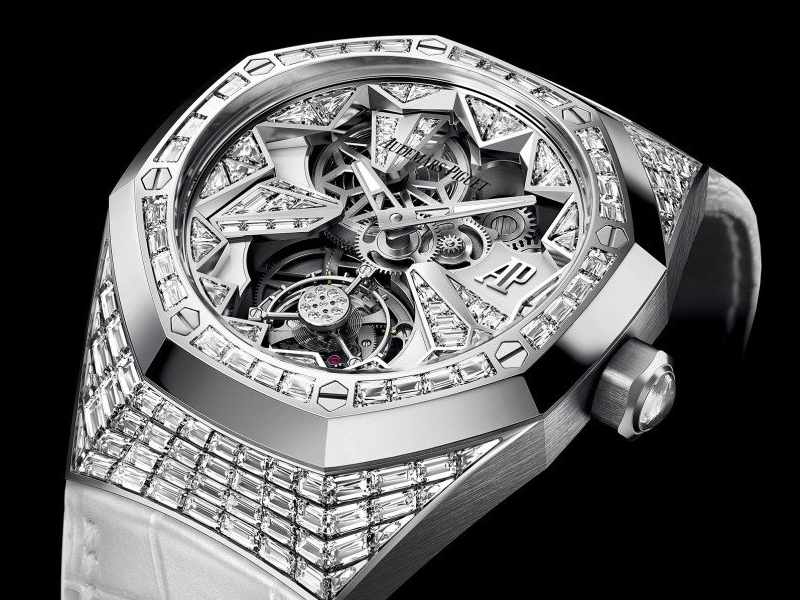 We previously reviewed the diamond studded ladies “Royal Oak Concept Flying Tourbillon” you can read more about here. 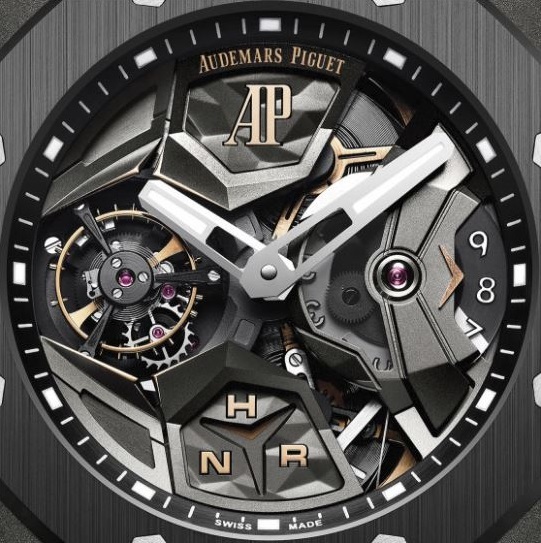 This new Audemars Piguet “Royal Oak Concept” comes in a 44mm case made of titanium with a transparent exhibition case back, which allows you to view the inner workings of the mechanical movement. While mounted to the watch is the iconic “Royal Oak” octagonal shaped bezel made of black ceramic with the exposed screws. It comes equipped with a screw-down crown near a push-piece that operates the chronograph functions, which also features sandblasted titanium push-piece guards to either side. All topped by a sapphire crystal that assists with water-resistance on this watch being able to reach up to 100 meters (330 feet). 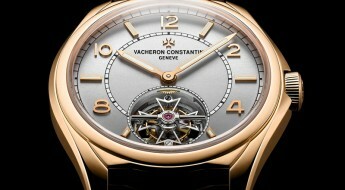 Time is exhibited on a partially skeletonized dial with other prominent complications. The black inner bezel circling around the dial has white rectangular hour index markers, followed by smaller minute index markers. 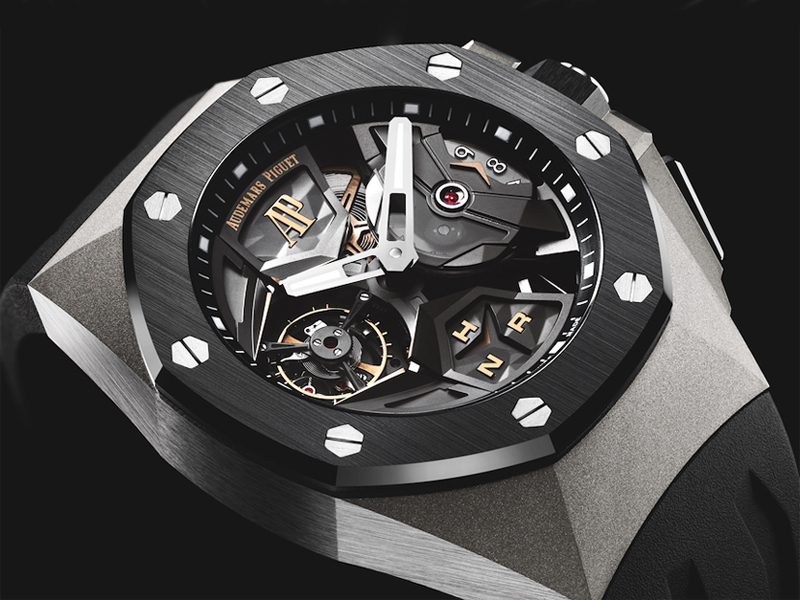 The “AP” logo and “AUDEMARS PIGUET” inscriptions can be seen aligned with the 12 o’clock position. There is a second time-zone indicator at the 3 o’clock position on a sapphire plate. At the 6 o’clock position we have a crown position indicator with the initials: H, R and N. Their meaning stems from their French origin: H is for heures (hours) so the crown is setting time, N is for neutre (neutral) when the crown is pushed all the way in, and R is for remontoir (winder) when it’s geared to wind the movement. While the flying tourbillon which can’t be seen via the exhibition case back, here fortunately is exposed and can be seen in all its intricate craftsmanship at the 9 o’clock position. The central titanium hands, hour and minute index markers have all been fitted with a luminescent filling, for an enhanced legibility. 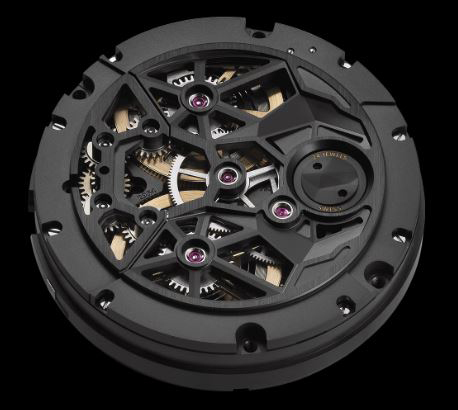 Also visible on the dials side are black sandblasted titanium central bridges, with polished and gold-toned facets. In spite of the exhibition case back, getting glimpses of the movement is also possible thru openings between the various moving components. 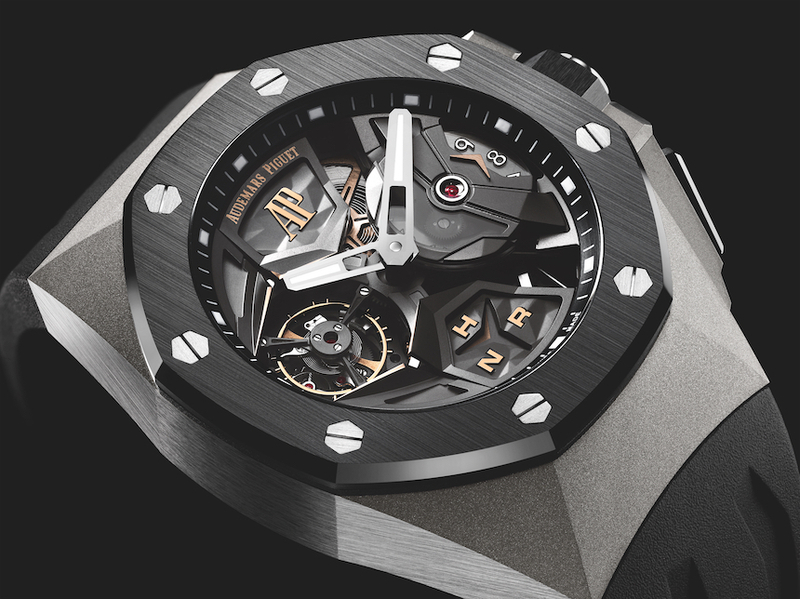 The “Audemars Piguet Royal Oak Concept Flying Tourbillon GMT” (Ref#: 26589IO.OO.D002CA.01) is powered by a hand-wound mechanical movement, caliber 2954 with 24 jewels, 348 components and 3Hz. Power reserve on this watch can last up to an impressive 237 hours (10 days), when fully wound. 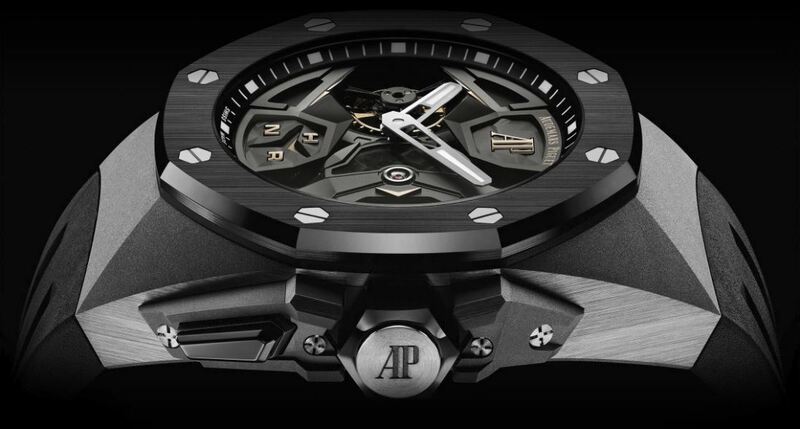 Mounted to the watch is a black rubber strap, secured to the wrist by a sandblasted titanium AP folding clasp. This watch also comes with an additional black alligator strap, also secured by a sandblasted titanium AP folding clasp. 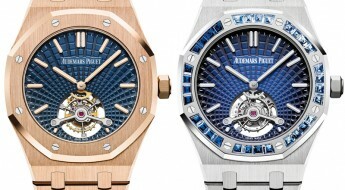 For more information visit the official Audemars Piguet website here.